LANSING — Lobbyists disclosed spending $39.4 million trying to influence state government in 2017. 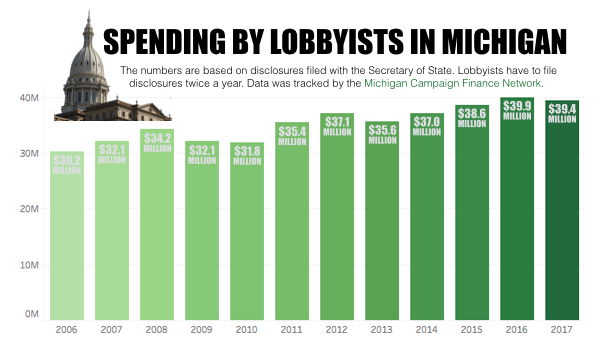 It’s the second highest total Michigan lobbyists have reported spending in a single year, according to state filings. Two other statements are also true about 2017: the spending total for the year fell just short of the state record; and it’s the first year since 2013 that overall lobbyist spending didn’t increase compared to the previous year. The record spending total came in 2016 when lobbyists reported spending $39.9 million. The 2017 total was down just 1.3 percent from the record total. 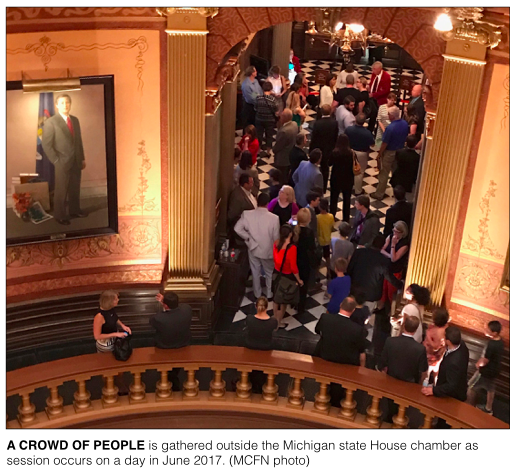 According to the Michigan Secretary of State’s Office, 1,491 interest groups and businesses were registered to lobby state officials in 2017. Groups have to disclose little information in Michigan about how they try to influence officeholders through lobbying, and lobbyists themselves even say privately that the disclosure requirements can be confusing. Lobbyists that represent multiple clients don’t have to disclose how much they’re spending to represent individual clients. Lobbyists also don’t have to disclose how much they’re spending working on specific pieces of legislation, making it difficult to draw connections between spending and the true impact of the spending on public policy. However, groups that lobby do have to disclose their spending totals across broad categories: how much they spent buying food and drink for officials; how much they spent on mailings; and how much they spent on overall lobbying, which includes the hiring of individual lobbyists. Much of the money that groups spend on lobbying goes to hiring firms and individuals who have built relationships with lawmakers to represent the groups in Lansing. The money poured in last year as lawmakers approved new tax breaks for large economic development projects, along with many other new laws, and debated significant changes to state auto insurance laws. As an example, at least 39 different groups, including hospitals, insurance companies and other businesses, stated positions in October on the auto insurance overhaul that was then pending before the House Insurance Committee. Individual issues that impact the bottom lines of groups help drive up lobbyist spending. For instance, in 2016 — the record year for lobbyist spending — Michigan lawmakers overhauled state energy laws. Groups like the Alliance for Solar Choice, Solarcity, Semco Energy and First Energy Service Company were among the top 200 spenders on lobbying in 2016 but decreased their spending and fell off the list for 2017. The full 2017 list of the top 200 spenders on lobbying in Michigan is available at this link. Who Spent The Most On Lobbying In 2017? As usual, the top spenders on lobbying in Michigan last year were multi-client firms that represent a wide array of interest groups. The top nine spenders were all multi-client firms, according to the Michigan Campaign Finance Network’s tracking. And 14 of the the top 20 spenders were multi-client firms. The largest firms in 2017, according to the disclosures, were James. H. Karoub Associates, which disclosed $2.0 million in spending, and Government Consultant Services Inc. (GCSI), which disclosed $1.6 million in spending. Each firm appears to have more than 90 active clients, according to their disclosures. According to state filines, Karoub Associates’ clients have included Apple, Central Transport, DTE and the Michigan Dental Association. GCSI’s clients have included AT&T, Consumers Energy, Meijer and the Pharmaceutical Research and Manufacturers of America. After Karoub and GCSI, the other top multi-client firms were Kelley Cawthorne at $1.3 million, Midwest Strategy Group at $944,268 and Muchmore Harrington Smalley and Associates at $632,414. 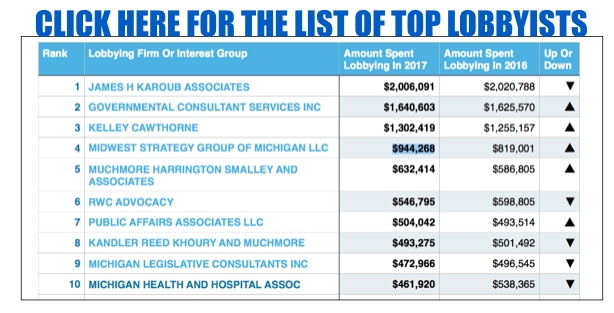 As for interest groups, those that disclosed spending the most on lobbying in 2017 were the Michigan Health and Hospital Association at $461,920, the National Federation of Independent Business at $342,214, Blue Cross Blue Shield of Michigan at $318,494 and DTE Energy at $292,946. Who Increased Their Spending In 2017? Of the top 200 spenders on lobbying, 111 either increased their spending in 2017 compared to 2016 or weren’t registered to lobby in 2016. Those 111 groups include Quicken Loans, which helped push for new tax incentives for a development project in the City of Detroit. Quicken Loans reported spending $236,197 on lobbying in 2017, compared to $59,126 in 2016. The social media behemoth Facebook registered to lobby in Michigan in February 2017, according to state records. Facebook reported spending $42,188 on lobbying the remainder of the year. The City of Rochester Hills also appears to have increased its investment in lobbying Lansing. The Oakland County city reported spending $45,900 in 2017 compared to $5,035 in 2016. Rochester Hills is far from the only public entity on the list of top lobbyist spenders. As some examples, the City of Detroit spent $51,413 on lobbying in 2017, the Executive Office of the Governor spent $96,000, and the Michigan Department of Environment Quality spent $42,451.